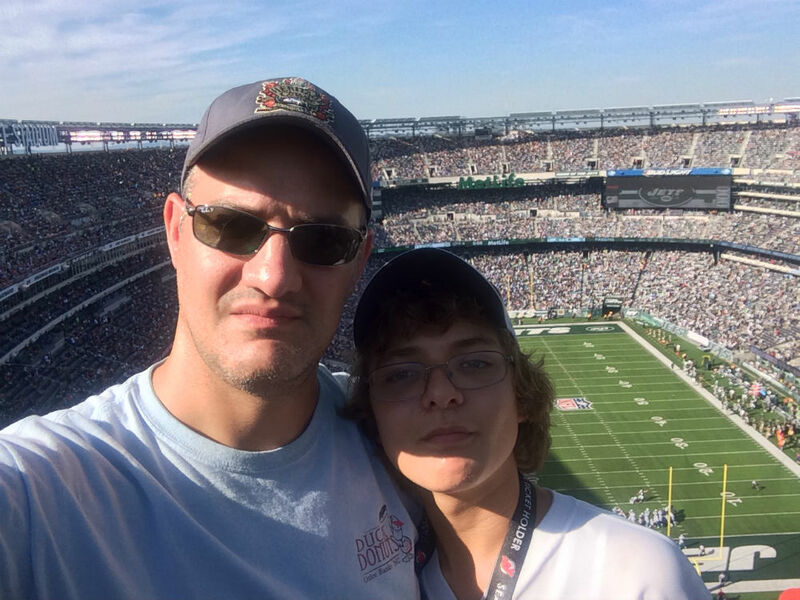 MetLife Stadium selfies are becoming a thing for us. Sunday was a beautiful, summer-like day in the Northeast. It was a touch hot to be considered fall “football weather,” but all things considered, it was a pretty ideal day to spend at MetLife Stadium watching a lackluster effort by the New York Jets against the Detroit Lions. Ideal, because of my companion. This is year three of Ryan’s sudden–proclaimed Jets fandom, and it shows no signs of abating. 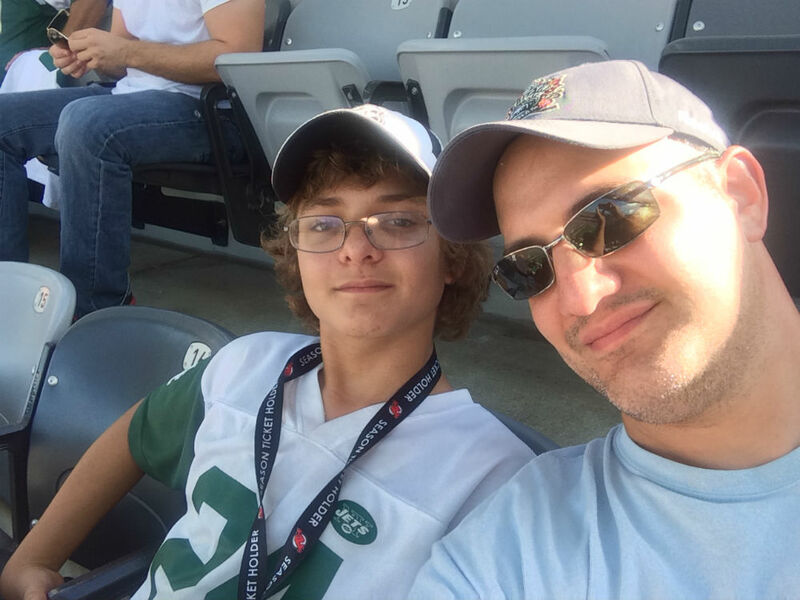 His interest in the Jets and football in general pales in comparison to the Sharks and hockey, but it’s enough that he wanted to attend the game and remained engaged throughout. As has been our tradition, the day included tailgating. All told, we were gone from the house for about seven hours. And it was easy. That’s not a surprise, nor has it been for some time. But it remains something for me to celebrate. A seven-hour block of time, spent in the company of my son, engaged in a topic of mutual interest? Please remind me if I ever start to take those for granted. We had a great time. Ryan enjoyed tailgating more than in the past. We threw the football in the parking lot. We ate steaks and burgers, courtesy of tailgate host C. Ryan engaged in conversation with my co-workers and their friends. We climbed (and climbed and climbed and climbed) to our seats in the next-to-last row of MetLife Stadium without complaint. From kickoff (actually, from the moment we pulled into the parking lot) Ryan was all about football. He paid attention to stats. He asked me about the Lions and their best player, Calvin Johnson. He looked for “Megatron” on every play. He cheered the Jets. He asked why the crowd was booing their quarterback, Geno Smith. He agreed with the decision to stick with Smith over his backup, Michael Vick. He recalled things learned at past games — how to find the stats and out-of-town scores on the in-stadium scoreboards, noticing the “orange sleeves” guy on the sideline that controls the television timeouts. We spent three hours conversing about football. And I know, because I’ve seen it too many times, that the next time we attend a game he will bring up something he learned at this one and build on it. The Jets lost, but Ryan remained engaged — and optimistic — throughout. The Jets lost to fall to 1-3, but Ryan took it well. I apologized to him and he said, “that’s OK, it was an exciting game.” He probably was the only Jets fan in attendance to feel that way. When I asked him why, he pointed out the key moments of the game, a few moments in the fourth quarter when the Jets had a chance to come back and tie the game. So this becomes yet another experience to file away, another memory generated to be recalled the next time we go to a game. As has become my habit, I made a point of telling Ryan how much I love taking him to games. It’s not something he does. It’s something he experiences. Whether it’s baseball, or football or (of course) hockey, there are no distractions when Ryan is at a game. He envelops the action. He seeks knowledge. He recalls things he’s learned at past games. There were a group of boys around Ryan’s age sitting near us in the upper deck. Maybe some of them were a year or two older. I assume they came with some adults, but they were sitting apart from them. The boys acted like you would expect young teenage boys to act. They were obnoxious. They joked with each other. They spent a lot of time on their phones. They sometimes watched and reacted to the game. They were wearing various school sports team shirts and hats along with their Jets gear. They looked like “popular” kids. I looked at them, joking around, barely paying attention. I looked at my son, engaged in the game, refusing to miss a single snap, enjoying every moment of the experience. I don’t want to judge but … I know how lucky I felt.